Pinot Noir by Seville Estate of Yarra Valley. Delicate strawberry and cherry characters backed by toasty oak. 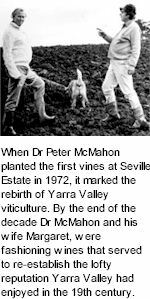 When Dr Peter McMahon planted the first vines at Seville Estate in 1972, it marked the rebirth of Yarra Valley viticulture. Seville Estate is a very personal expression from a unique site. Enjoy alongside roast or grilled duckling, confit or marinated game. A new generation of the McMahon family has also become involved in Seville Estate. Peter and Margaret’s grandson, Dylan McMahon is now the winemaker, following the passion ignited a generation before. The Seville style focuses on elegance and finesse, while showing fantastic complexity and structure. They are cool climate classics that stay true to the vineyard and vintage influences. Today 35 years after Peter and Margaret started the dream, Seville Estate enters its third phase. Graham and Margaret Van Der Meulen purchased the property in December 2005. They are fully hands-on in the vineyard, winery, and cellar door and plan to continue Seville's long-established record of producing consistently high quality wines. There is a real comfort in knowing that the wines are made on the Estate. You can wander through the winery, taste from barrels and feel the care and attention given to each one. Everyone involved is passionate, including Joan and Dave who have worked in the vineyards for nearly a decade tending the vines. Situated on a ridge of red volcanic soil overlooking the upper Yarra Valley – hidden from the well-trodden tracks of the mainstream, the soils at Seville Estate are extremely fertile red to grey volcanic, over a clay base. The vines are substantially dry grown, as irrigation is only used when the vines are under extreme stress. Old Vine Blocks use a T-trellis system to control the fervent growth in the vines which results in low cropping of 2 tonnes per acre. The blocks planted in the 1997 use Vertical Shoot Positioning. The vines are all hand pruned to the method of cane pruning. This method requires a good understanding of the vine and is more labour intensive. This also achieves better management and control for next years crop level. Seville Estate is a very personal expression of wine from a unique site. The planting, pruning and harvesting of the vines is done with the same passion as that applied in the winery. The vines face north-east with an altitude of 200m above sea level. Vintage comes to Seville Estate much later than other areas in the Yarra Valley. The elevation provides cooler temperatures that achieve more consistent ripening with good fruit and spice aromas developing in the grapes. The philosophy at Seville Estate is to capture the fruit expression of this unique vineyard, in wine styles that show cool climate complexity and finesse. 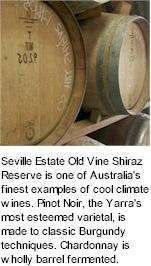 There are three labels in the Seville Estate range. The Barber are great introductory wines, the Estate range are made with the addition of new vineyard plantings, being a blend of old and new vines. The Reserve range draw exclusively from the small planting of the original 34 year old vines while the Reserve Pinot Noir and Chardonnay are selected from the best parcels. Seville Estate Old Vine Reserve is one of Australia's finest examples of cool climate Shiraz, the flagship of the range, while very approachable in its youth, is made with longevity in mind. Pinot Noir, one of the Yarra's most esteemed varieties, is produced at Seville Estate using classic Burgundian techniques. Low cropping levels ensure the intensity of the fruit flavours. Chardonnay is wholly barrel fermented. The Barber range enable Seville to adopt 35 years of winemaking knowledge and experience into different styles and varieties and complimenting the Estate wines. It’s interesting making diverse wine varieties and styles, these wines allow Seville to expand their selection and add appeal.